Surprise! Capcom announced during Tokyo Game Show 2018 that it’s bringing Phoenix Wright: Ace Attorney Trilogy to the PlayStation 4, Xbox One, Nintendo Switch, and PC in early 2019. The trilogy, which first released on Nintendo 3DS in 2014, includes Phoenix Wright: Ace Attorney, Phoenix Wright: Ace Attorney – Justice For All, and Phoenix Wright: Ace Attorney – Trials and Tribulations. It’ll feature updated visuals, English and Japanese language support, and up to ten save slots. Defend the innocent and save the day! 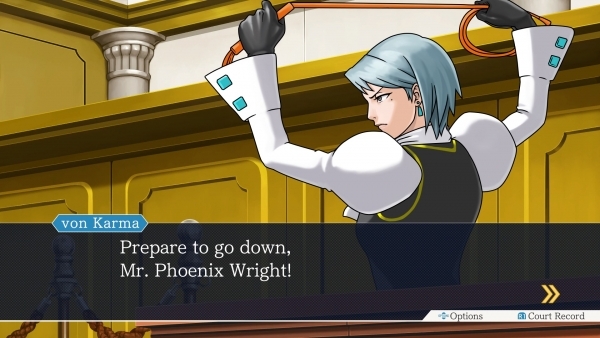 Courtroom hero Phoenix Wright lays down the law Phoenix Wright: Ace Attorney Trilogy. Join rookie lawyer Phoenix Wright through the early years of his career in his quest to find the truth behind all of the classic cases! Prepare for intense courtroom showdowns by investigating crime scenes, collecting evidence, and questioning witnesses. Use evidence and the testimonies of witnesses to your advantage as you battle for the innocence of your client. Nothing less of a full acquittal will do in this court of law. Find the contradictions in witnesses’ testimony to expose the truth! Capcom has said that it’ll release more information soon so stay tuned.